One of the side-benefits to learning is getting the jokes. Στέφανος means "crown". The "martyr's crown" is a common image, so I had never paid much attention to its use in the liturgy for St. Stephen. This year, however, my still rather limited Greek vocabulary couldn't help but delight in noticing the plays on the word throughout. Stephanus ergo, ut nominis sui coronam meruisset accipere, caritatem pro armis habebat et per ipsam ubique vincebat. Therefore Stephen, that he might merit to recieve the crown of his name, had charity for arms, and through it, he conquered all. I am a Catholic Christian seeking deeper understanding of God's work in the life, history and tradition of the Church. This blog is intended to serve as a log of this quest, consisting primarily of reactions to books I read in the course of it. My perspective is that of a Catholic generalist. My bachelor's degree is in Mathematics, but I earned a minor in philosophy and participated in a "Great Books" Honors curriculum that exposed me to a wide range of the most important history, literature, philosophy and theology of Western Civilization. Since then, I've been a bit of an omnivore, reading widely in philosophy, theology and history, but seldom deeply anywhere. This is, in part, an attempt to remedy that, by focusing on a particular area and forcing myself to pull out the most important ideas and put down my own thoughts. 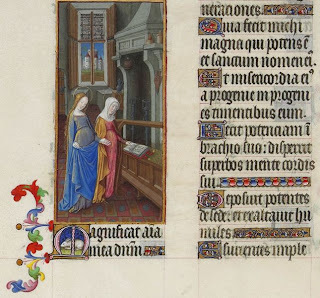 The title (in Latin, following well-established Catholic blog cliché) is from Mary's Magnificat, as recorded in St. Luke's Gospel (Lk 1:46-55), which the Church has sung at Vespers since the first millennium. Mary witnessed the fulfillment of the Lord's promise, a promise she knew of because the Lord had spoken to our fathers (Lk 1:55, "ἐλάλησεν πρὸς τοὺς πατέρας ἡμῶν", "locutus est ad patres nostros"). We, like her, await the coming of the Lord, and, in the face of the modern temptation to regard history as bunk and pretend to re-invent culture and faith de novo every generation, we too must remember that we have only recieved this promise because the Lord spoke to our fathers. We have recieved that promise from the Lord through their diligent efforts to keep and hand on the faith. If we are to grasp its richness and understand its context, we would do well to get to know them.